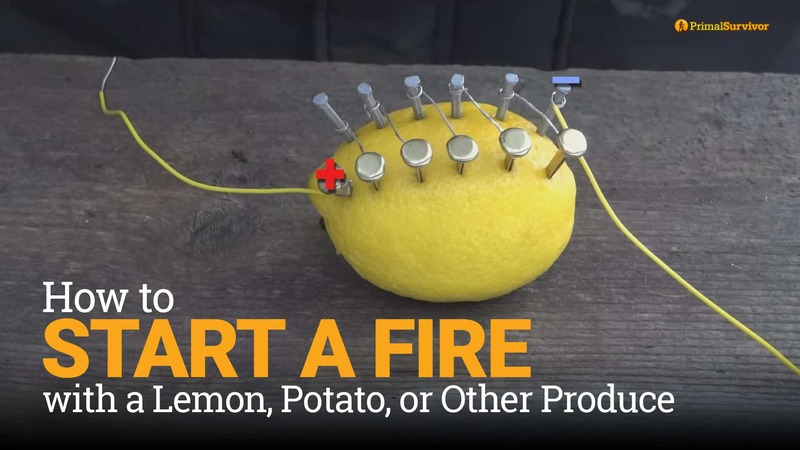 There has been a viral video floating around which shows how to start a fire with a lemon. 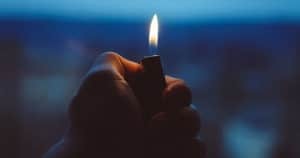 Because fire is one of the fundamental pillars of survival, this is a great trick to learn. 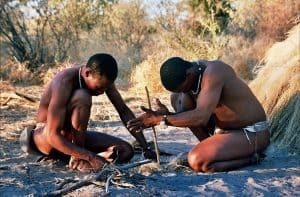 However, I want to point out that survival hacks are pointless if you don’t learn the science behind them. For example, I find it ironic that the lemon video is shot in the wilderness. Where are you going to get a lemon in the wilderness??? Once you know how this survival trick works though, you’ll realize it can be used with other types of produce or even wild tubers. Let’s ignore the fact that North Survival seems to have found the only lemon in all of the woods! 😉 Here is a recap of the video in case you don’t want to watch. Roll the lemon a bit. You want it to be softer. 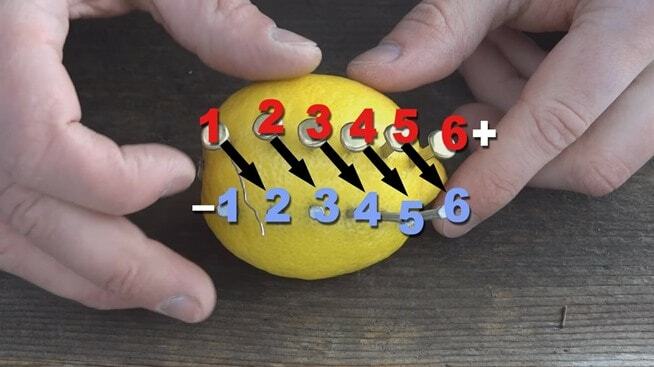 Stick the copper clips into the lemon to form a row. The clips should be about 1 cm apart. Now stick the zinc nails into the lemon to form a row parallel with the copper clips. Don’t let the nails and clips touch each other! Take one of your short pieces of wire. Wrap it around a copper clip and then wrap the other end around the zinc nail diagonally across from it. Do this with all 5 short pieces of wire. On one end, there should be a clip without a wire on it. Attach a longer wire here. On the other end, a nail should be without a wire on it. Attach the other longer wire here. These are your + and – charges, like on a battery. See the image below. Touch both ends of the wire to your tinder at the same time. It should ignite the tinder! The sites Homemade Circuits and Home Training Tools do a good job of explaining why this trick works. Basically, it is the same principle as with a potato battery (you remember making one of these in school, right?). Lemons, potatoes, and other living things contain electrolytes. When you put two different types of metal in an electrolytic solution (the lemon), the acids in the lemon start to react with the metals. An electron imbalance occurs at each electrode. The electrons start to flow back and forth to one another through the lemon. The movement of these electrons is current which can be used as a battery. Basically, you’ve just made a battery. In this case, the copper clip is the positive (+) side of the battery and the zinc nail is the negative (-) side of the battery. You could use this configuration as a battery to power small devices. Or use it to start a fire by touching the positive and negative sides of the lemon battery to some tinder. ***Note that you can start a fire with a regular battery this way too! 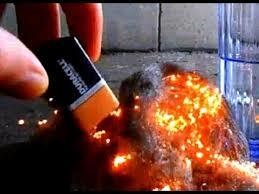 Just touch both ends of a battery to some steel wool or even a piece of chewing gum wrapper at the same time. The current going through the flammable foil will cause it to ignite!!! All living things contain electrolyte solutions. So, in theory, you could use this exact same method to make fire starters or batteries out of things like trees. However, not all things are good for making your fire starter. 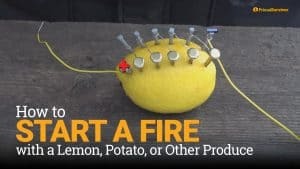 The reason that the lemon works so well as a fire starter is because it is acidic. The acids have a strong reaction with the metal so they produce more electron movement. Other acidic foods also work great for your produce fire starter. Potatoes work because they have phosphoric acid. Tomatoes, grapefruits, oranges, jars of vinegar, and sauerkraut juice (which is lactic acid) also work great! 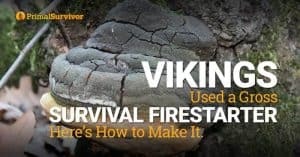 In a wilderness survival situation, I bet you could dig up some roots and try using them to start your fire. What If You Don’t Have Zinc or Copper? Zinc and copper should be pretty easy to scavenge in a disaster situation, and you probably have some of these metals in your home already. But, if you can’t find zinc or copper, other metals can be substituted. Lead, magnesium, and iron all work fairly well for making a lemon fire starter. However, the voltages can be different so you might have to play around it with. 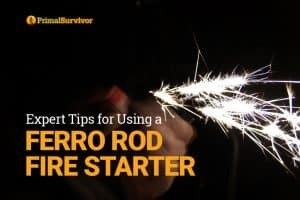 Below I’m including videos of a potato fire starter and a tomato fire starter so you can see just how versatile this is. With just some basic supplies, you can easily get a fire going or even power some devices. Use the toothpicks to poke holes in one half of the potato. Run the two wires through the holes you just poked. Their ends should be flush with the cut side of the potato. Use the spoon to cut out a small dip of flesh from the other half of the potato. Pour salt into the dip you just cut out. Squeeze some toothpaste into the dip and mix it with the salt. Put the potato halves back together. Secure them in place using the toothpicks. The wire ends will be touching the salt/toothpaste mixture inside the potato. Wrap some cotton (or toilet paper) around one of the ends of wire sticking out of the potato. Wait 5 minutes or so. Now touch the other wire to the cotton. It should ignite the cotton! Want to see even more ways this can be done? Check out the video below which shows how to make a tomato battery. Remember, once you’ve made a battery, you just need to touch the positive and negative ends to some tinder to ignite it! Have you ever used any cool hacks like this for survival? Let us know in the comments or join us in our Facebook group!